There has been an ongoing dialogue in my household about who would be the principal carer for any future offspring. FFOMC is desperate to become a house husband and mentions this quite frequently. It is a topic of conversation usually raised first thing in the morning, immediately after he has staggered out of bed and is confronted with the prospect of a day at the office. This does bring into question his motives. I have been wondering how he plans to manage childcare, the responsibilities for maintaining our house and still find time to feed his gaming addiction. 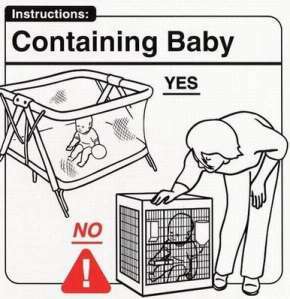 That was until he let it slip last night that while he was otherwise occupied the baby would be in its baby cage. Sufficient to say that my concern about his suitability for parenthood may be justified!